The first known building on the site was a Saxon hunting lodge for Earl Edwin. After the Norman conquest the estate was given to Hugh Lupus, and it remained in the possession of the Norman earls until 1221, when it passed to the Crown. Henry III granted the manor to Hugh de Corona. Hugh's son Thomas, who had no children, granted it to his sister Ellen, who married John de Legh of Booth in the early 14th century during the reign of Edward II, after which it became the ancestral home of the Leghs of Adlington. Originally the hall consisted of timber-framed buildings on three or four sides of a courtyard surrounded by a moat. 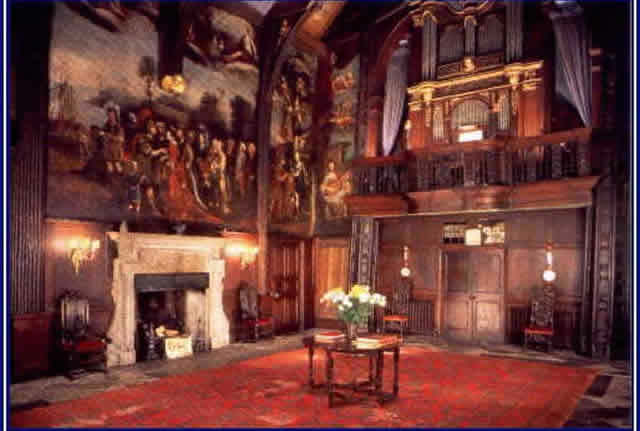 The Great Hall, on the north side of the courtyard, was built between 1480 and 1505 for Thomas Legh I. The east wing and porch were added for Thomas Legh III in 1581. During the Civil War the hall was held by Colonel Thomas Legh for the Royalists but was taken twice, in 1642 and in 1644, by the Parliamentary forces. The hall was returned to the Leghs in 1656, and the north front was restored in 1660. Between 1665 and 1670 the north wing was rebuilt for Thomas Legh IV. Windows were inserted and along with the Great Hall, excluding the porch, it was encased in brick. The estate was inherited in 1739 by Charles Legh, who embarked on a major programme of reconstruction, transforming the hall "from a medium-sized Tudor house into a large Georgian manor". He built a new west wing, which contained a dining room, a drawing room, a library, and a ballroom, the last occupying the whole length of the first floor. He then rebuilt the south wing, connecting it with the new west wing and the older Tudor east wing. At each end of the south wing was a pavilion with a canted bay on its south front. The west pavilion contained the southern end of the ballroom, and the east pavilion housed a chapel. During this time the stable block and other buildings were constructed in the grounds. The hall is surrounded by a landscape park and woodland, covering in total about 160 acres (65 ha). In addition to the buildings in the grounds, Charles Legh played a large part in designing the layout of the gardens in the 18th century. Over the years parts of the grounds have become overgrown, and the condition of the buildings has deteriorated. Since the 1950s work has been carried out to improve the grounds, and to develop parts of the gardens in a more modern style. To the north of the house a rose garden has been created and, beyond that a yew maze. 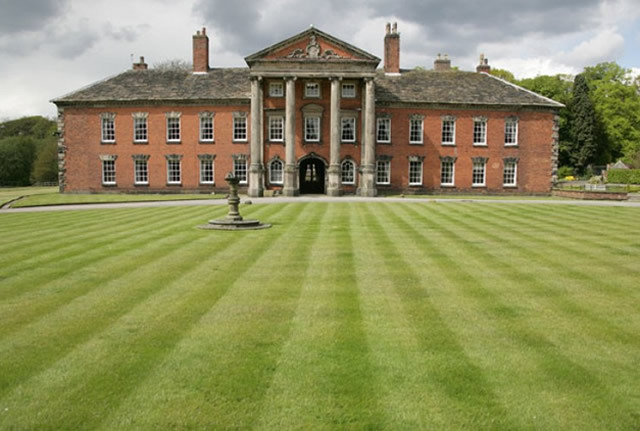 Adlington Hall is designated a Grade I listed building which means that the building is acknowledged to be "of exceptional interest, sometimes considered to be internationally important". The hall is still privately owned by the Legh family, who live in the hall. Wheelchair accessible with some limitations in the hall. The Organ in the Great Hall is one of Englands most important 17th century musical instruments. Admission price for the House includes a guided tour. There are accessible toilets in both the Hall and The Hunting Lodge, where there is also a lift.